Ideal to cleanse face and body of sensitive and atopic-prone skin daily and is suitable for babies, children, adults. This soap-free, paraben-free and lightly perfumed liquid gel is enriched in superfatty and moisturizing agents. Without drying the skin, it preserves the hydrolipidic film. 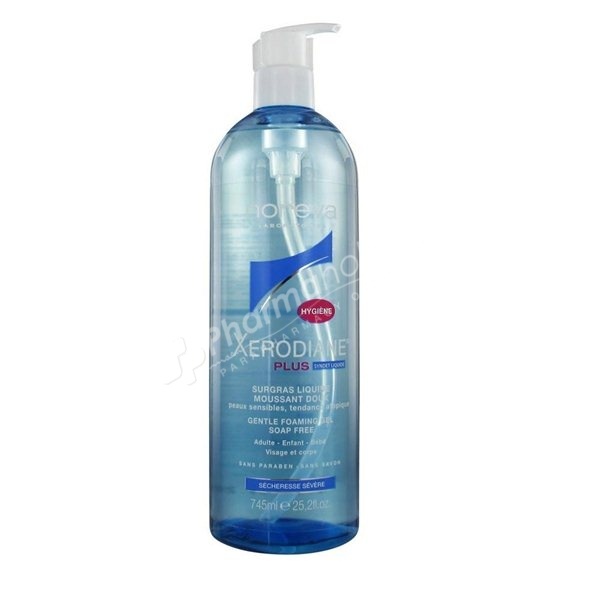 Specially developed to gently cleanse dry, very dry, sensitive, atopic skin and avoid any drying effect, XERODIANE PLUS Gentle foaming gel soap-free protects and moisturises the skin on the face and body. Its well-tolerated formula means it can be safely used daily on infants, children and adults. Use daily during outbreaks of inflammation or in remission on the face and body, on damp skin. Rinse. Can be used to wash the body and hair of infants. Aqua, Glycerin, Sodium Laureth Sulfate, Acrylates/Steareth-20 Methacrylate Copolymer, Sodium Lauroyl Sarcosinate, Phenyl Alcohol, Peg/PPG-22/24 Dimethicone, Sodium Cocamphoacetate, Parfum, Tetrasodium Edta, Sodium Hydroxide, Oxirane, Sorbic Acid, Sodium Chloride, Sodium Lauryl Sulfate, Sodium Benzoate.